Crazy quilting, or crazy patchwork as it is also known, is a glorious obsession! It is no surprise that this Victorian art form has experienced a resurgence in present times. There are so many reasons for embroiderers to enjoy this technique. 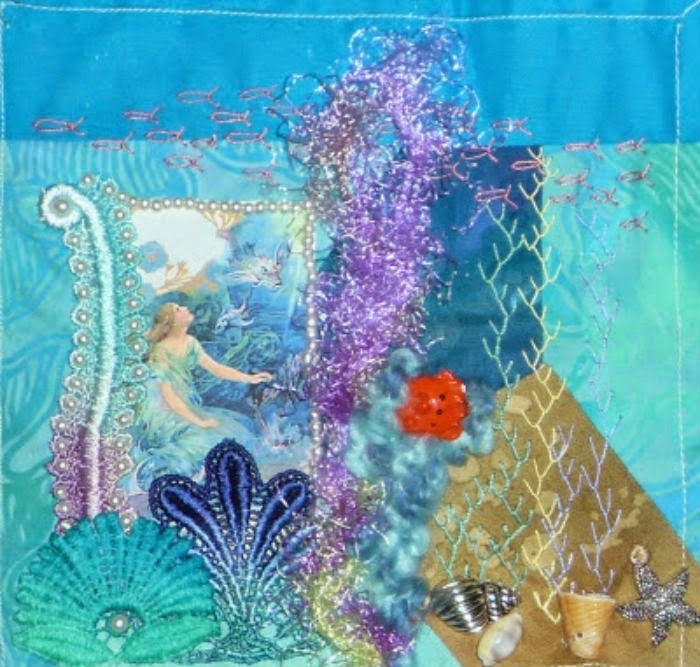 Themes, such as Under the Sea, are very popular in modern crazy quilt blocks. These themes give a stitcher opportunities to look at many things in new and expected ways. 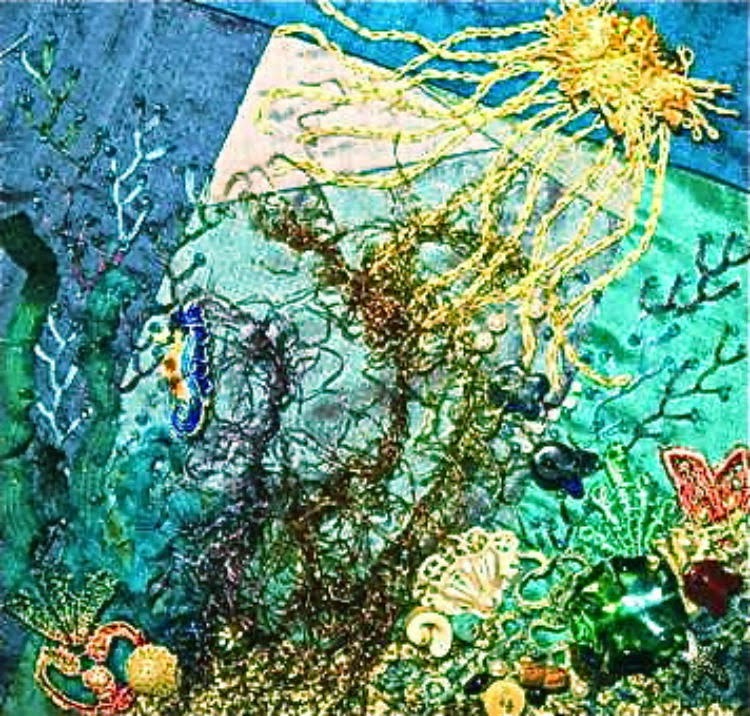 Novelty yarns beg to be used to create seaweed. 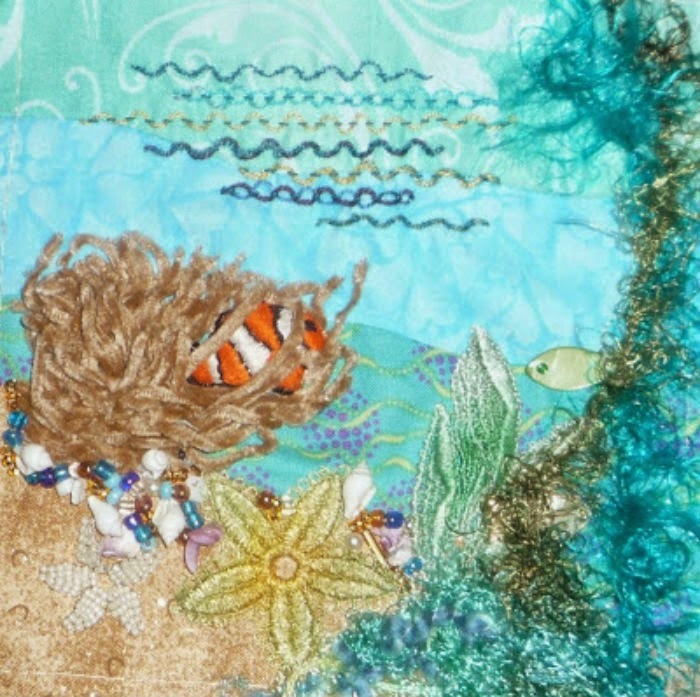 Feather stitch lends itself beautifully to the creation of aquatic plantlife. Lace can be hand-dyed to become flora or fauna. Images can be transferred to silk or cotton and used as custom “silkies”, the modern interpretation of cigarette silks. Beads, charms and upcycled pieces of costume jewelry add some bling! Even cheap shell tourist necklaces can be taken apart and used to embellish. Virtually any needlework can find it’s way in. 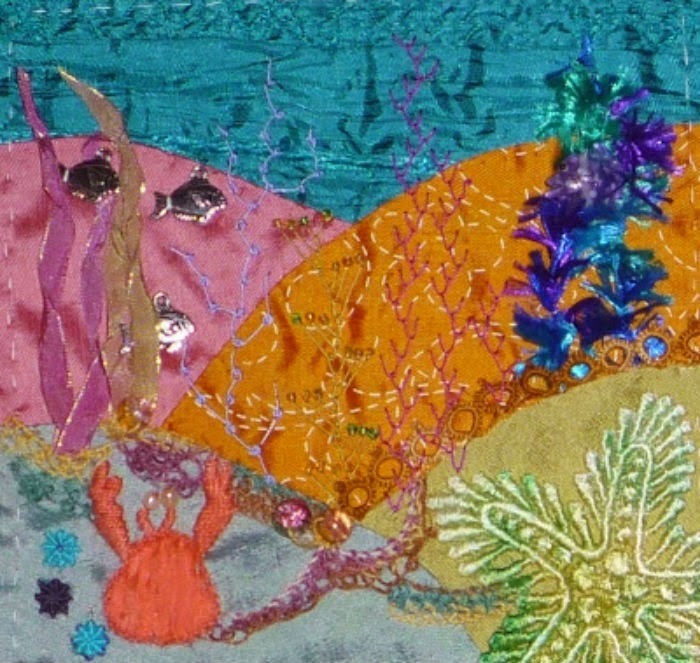 Can you find the tatted sea creature floating across this scene? 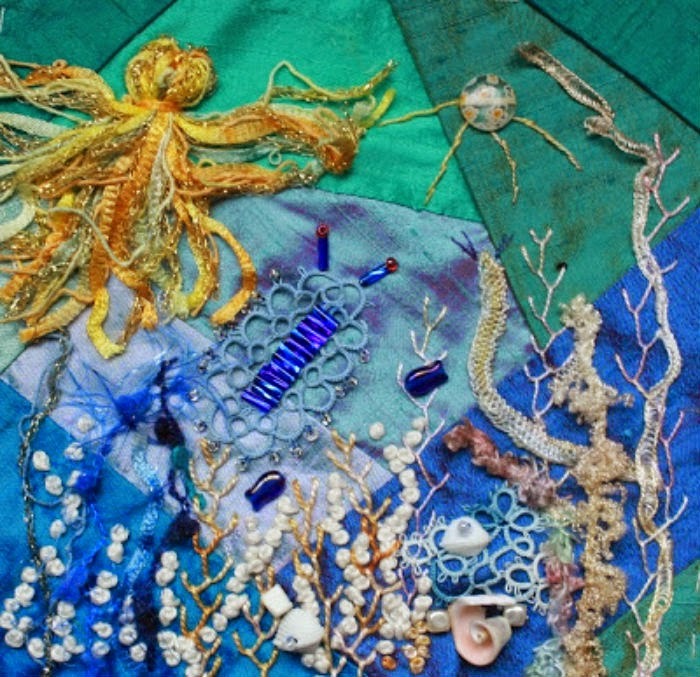 Ribbon embroidery turns up in unexpected ways such as the creation of a sea horse. The only limit is your imagination! 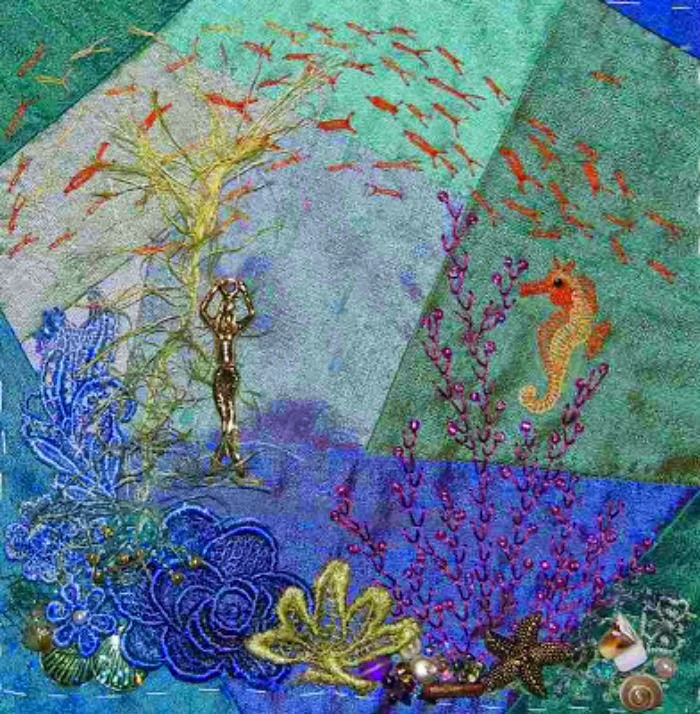 The crazy quilt blocks that grace this post were created for me by friends or by me for them. Thank you goes out to Carolyn, Alice, Beryl, Ritva, and Nicki Lee at Crazy Quilting International! Now, as promised in the title, a giveaway! If you have enjoyed this post and the eye candy in it, leave a comment on this post before February 1st. One name will be chosen randomly and announced here on Feb 1st. Please be sure to leave a way to contact you in case you win. Do you want to know what you are playing for? 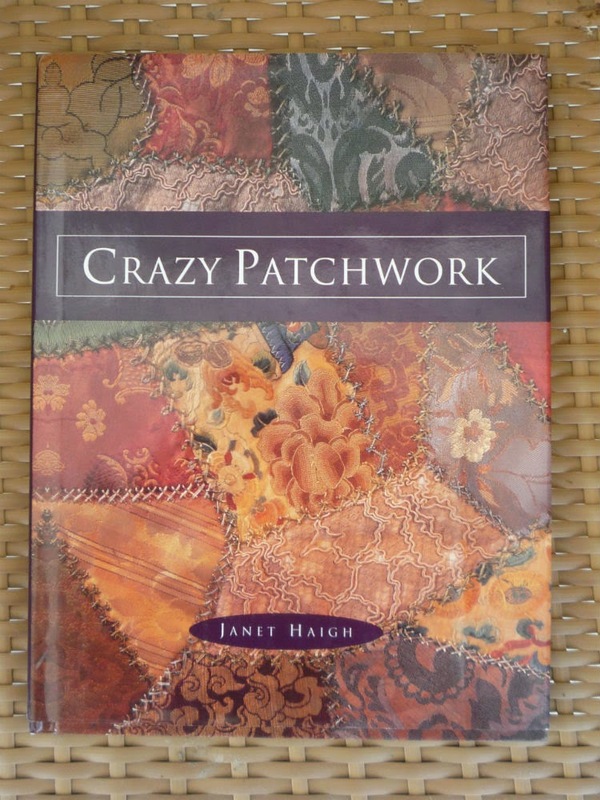 This giveaway is for a copy of Crazy Patchwork, written by Janet Haigh. Love the block w/ the school of little orange fish, they really look like they are moving! Nicki Lee inspired my love for under the sea blocks. These are lovely! UTS has always been one of my favorite themes to do a RR in. I love my beautiful seahorse that you made me! Lovely blocks! And oh such a fine book. I'll join this giveaway who knows...Anyway wish the coming owner of this book a lot of fun. This is my favorite form of quilting. 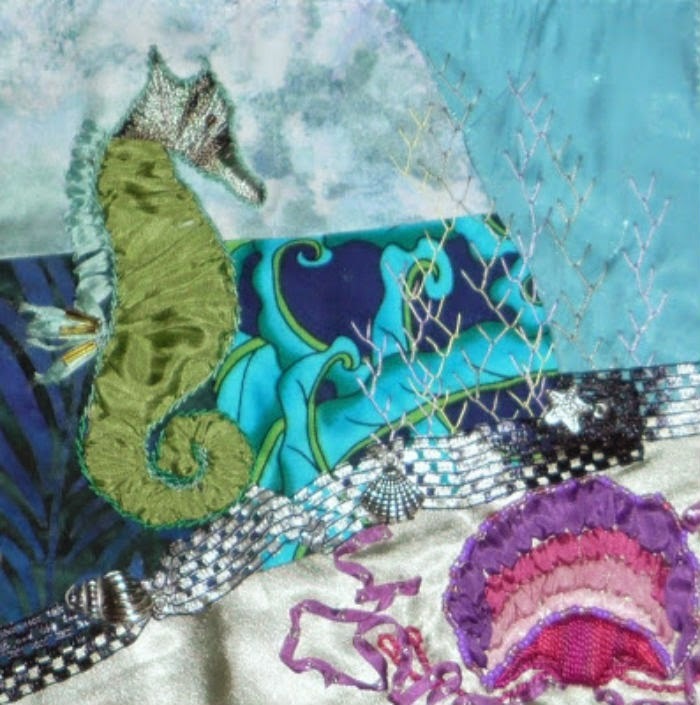 I am an artist with the medium of a needle and thread and my quilts will tell a story . I don't care about winning this book. I am sure it is amazing, but the blog was enough to study and learn from for awhile. I hope you have more posts like this. I love all of the blocks, it certainly gives plenty of ideas for UTS blocks, but also different ways to use unique materials. :) Thanks for hosting a giveaway. Thank you Kerry showing the UTS blocks! It was a great RR. Might join the new one. Amazing work! I loved the fresh direction for crazy quilting possibilities! Love these crazy patch blocks! Beautiful! Thank you for the opportunity. I'm in love with CQ! These blocks are beautiful eye candy! Thank you for a chance to win a great resource! Lovely post! I'll be back to check for future posts. Always like to see beautiful embroidery as it is such an inspiration. Thanks for the chance to win this book! I discovered CQ about a year ago and am loving it. Thank you for the chance to win this book. I re-discovered CQ after another pastime stole my heart about 10 yrs ago, and am enjoying getting back to feather stitches and "silkies"...AND I can use my newfound enthusiasm for beading in my CQ. :-) Would love to have the book for some more/different ideas! Just love all the blocks! They inspired me for my UTS! Thank you ladies. Hope to win the book, I can use all the help I can get! I'm new to CQ and love the inspiration in these pieces. 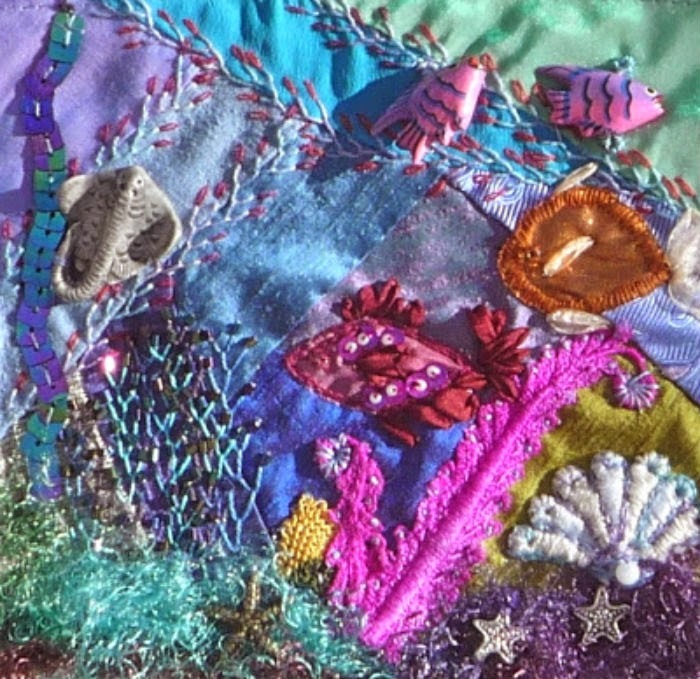 Hi Kerry, your Crazy Patch blocks are very beautiful and inspiring, as most of us have a stash of pretty things that could easily be incorporated into this type of project. Thanks for sharing your work. 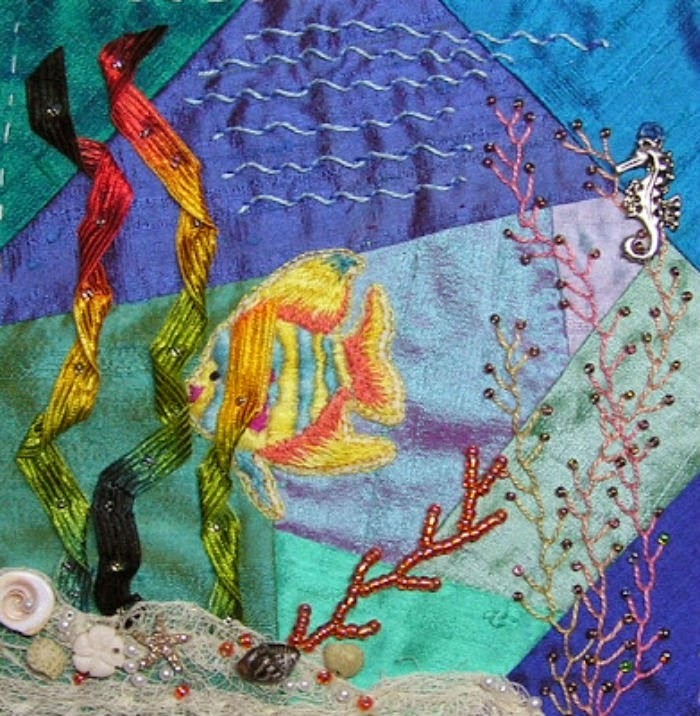 Awesome embroidery, and its such a wonderful project to see the many different and varied scenes of the one subject, loves it!!! beautiful blocks, so much to enjoy would love to have this book to add to my library. I love your blocks and stitching and would love to have the book too! Oh this book looks fabulous! Thank you for the chance to win. These photos have given the term "eye candy" a new definition! I would be so happy to be able to produce such beautiful things! Just starting out in this medium. Love the blocks displayed! Your work is simply stunning. Thanks for the fantastic giveaway! Under the Sea is so much fun, so many possibilities. Thanks for the chance to win. VermontPines at aol dot com. Under the sea is one of my very favorite themes, and the pictures you've shown really show it off to its best advantage! Great job Kerry, I would like to be added in your give away. So glad your still active in CQ. Wow! Absolutely beautiful. Please enter me in the drawing for the book! Wonderful blocks! Thanks for sharing all these great pictures and for the draw. What beautiful blocks. Boy do I need to practice to get that good. Beautiful work done by such talented ladies!!! Thank you for offering the book as a giveaway. The book looks wonderful...love all the pictures...such inspiration. Very vivid colours and exquisite embroidery. I love crazy quilt patchwork. Thanks for the book give away. Love the inspiration! What fun! Thanks for the chance to win this beautiful book. The charms and ribbon work is so beautiful! I sure hope to win the book! Love the super colours and textures. Great pics. Beautiful and inspiring photos! So fun to see them! I'd LOVE to have the book as well! Crazy quilting is something I've wanted to explore for a while. Beautiful photos in the post! I love the Under the Sea blocks. Thanks for such a great giveaway! I would love to have this book! What great color & inspiration! Love all the handiwork! Gorgeous eye candy! Oh, such pretties! Just makes you want to stitch something! Hi Kerry - your work is lovely. I'm inspired to get back into more CQ quilts. Thanks for your generosity in making the book available. I love all of the eye candy!! I'm just getting started in Crazy Quilting and I love it!! I thought this was already closed. Received an e-mail dated today 2/2/15. January - It’s a Wonderful Time of Year!